The Young British Artists (YBAs) stormed on to the contemporary art scene in 1988 with their attention-grabbing, ironic art. They exploded art-world conventions with brazen disdain. Dismissed as trivial gimmickry and praised for its witty energy, their art made a mark both on the art scene and on public consciousness that continues to reverberate today. Now, almost three decades after they emerged, Artrage! tells the story of the YBAs with the benefit of perspective, chronicling the group’s rise to prominence from the landmark show ‘Freeze’ curated by Damien Hirst, through the heyday of the 1990s and the notorious ‘Sensation’ exhibition, to the Momart fire of 2004 that seemed to symbolize the group’s fading from centre stage. 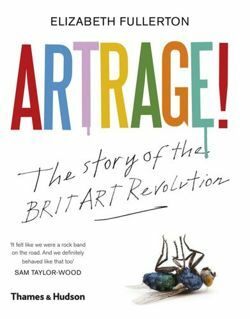 The book ends with an update on the artists’ careers and fortunes in the last decade. Drawing on interviews with all the key BritArt players and extensive archival research, Elizabeth Fullerton examines the individual characters, their relationships to one another, crucial events and seminal artworks, considering, too, the political, economic and artistic context of those years. Plentiful quotations bring out the distinctive personalities and provide fresh insights into the people and the period. Among the artists discussed are Damien Hirst, Rachel Whiteread, Tracey Emin, Jake and Dinos Chapman, Sarah Lucas and Gary Hume.